Home » Uncategorized » Surrogate Motherhood- Times Three! What an amazing story appeared this week on the cover of Israel’s most popular newspaper. A religious Israeli couple, Ophir and Avishag, become parents to TRIPLETS this week after 8 years of marriage and many, many miscarriages. But what’s even more amazing is that Ophir (38) and Avishag (36) finally became parents through the kindness of a woman, identified only by her initial “A,” whom they didn’t even know before she became the surrogate mother of their children. Under the halachic guidance of the rabbis at the Puah Institute, Ophir and Avishag decided to pursue the option of finding a surrogate mother to carry their biological child. What nobody expected, Ophir, Avishag, and “A” alike, was that this would end up being such a difficult pregnancy– with triplets. When their doctors pressured Ophir and Avishag to abort one of the triplets in order to increase the chances of survival for their remaining two children, Ophir and Avishag weren’t sure what to do, but it was “A” who put her foot down. None of the fetuses she was carrying would be aborted. Period. While it is a tremendous kindness to carry the baby of a stranger who can’t do it herself, willingly submitting oneself to the difficulties and medical complications involved with carrying triplets is truly incredible, truly heroic. And in the end, “A” was right to be stubborn. 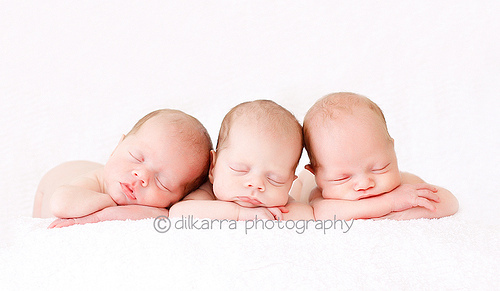 Born in their 33rd week, Ophir and Avishag’s triplets are tiny but perfectly healthy. Two girls and boy. Mazal tov, Ophir and Avishag! May you merit to raise your three cuties to Torah, Chuppah, and Good Deeds! CHANA THANKS FOR A TERRIFIC ARTICLE! In the Torah it is written that if a woman starts to conceive and gives birth to a boy, then on the 8th day he should be circumcised. We must admit that the recipe for the male origin is not considered here, but we are talking about future surrogate mothers. It is alleged that in the case of replanting a non-Jewish surrogate mother, a fertilized Jewish ovule of a newborn should not be circumcised – it is a non-Jew.